It's had to believe how low Festus has descended all because of money and power.. A so called human right lawyer! Shame!! Reno should go and sit somewhere, was he not once like Keyamo until he was side tracked 😏😏😏. Yeye dey smell. Gone are those days when we have people like Gani Fawehinmi. You're delusional to call Falz father honourable. 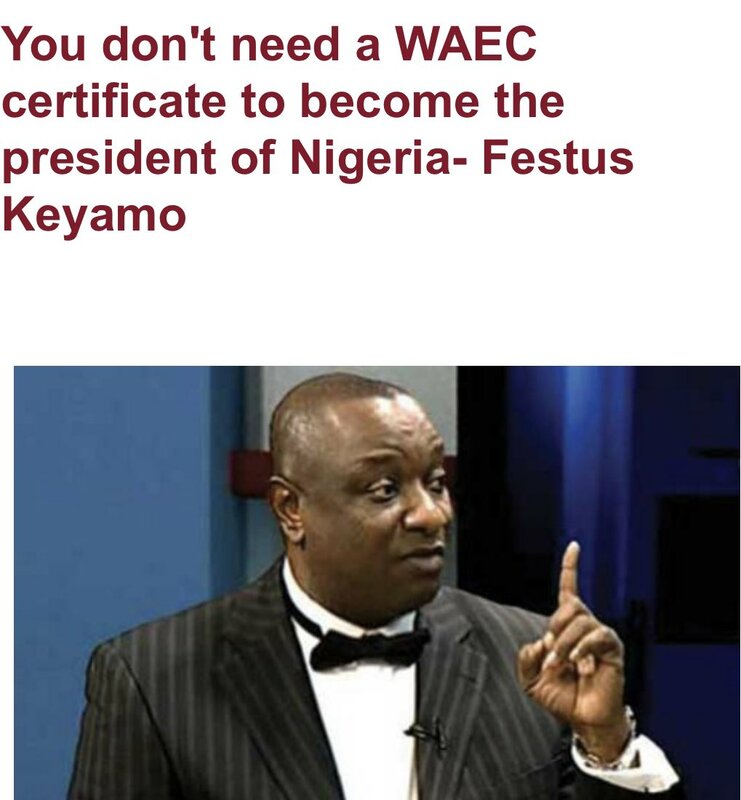 I have never liked this Festus Keyamo. He's one of the most annoying persons I've ever known. Very annoying,i don't like him. You're not alone gorgeous Lilian. Festus keyamo is the sleaziest and most morally decayed lawyer I know. Cheap article of a human being who has allowed money eat his brain. It's such a shame how a man can descend so low as to lie even to himself. I shame for his family. Thought it's only me oooo! I don't like the man no be today sef. Na wa. They are all birds of the same feather. Reno did worse for Jonathan. God bless you Bianca, dont mind Reno: he did the same until he was side tracked. He was used and dumped so he should leave Keyamo alone, they are all birds of the same feather. Anon, keep deceiving yourself if it makes you feel better. No-one has ever gone as low as Keyamo. i pity nigerians that channel their energy into supporting both pdp and apc.allow them to do their dirty fights.they know themselves. atiku can never be president and buhari will rule till 2023.for them to come out with these comic responses should tell you one thing..the tribunal matter is already settled.they just want to play around.all you thinkin to collect back stolen mandate should wake up.all talk and last last nothing go happen.they might settle atiku behind closed doors.mtcheewwwww. tjay carry their matter for head like gala oh.keyamo is only doing his job.i will do same too.lemme go hustle jhareee.mediocrity everywhere.. Even I who is an _ _ is surprised at the way and manner at which Festus Keyamo changed overnight. The way Keyamo sounds these days eish! Always aggressive, talking in a loud tone. I no longer bother listening to him. His voice irritates me. Festus is lost, he is finished. This man is the biggest disgrace I knew since the last goat was grilled. What a country.. you don't need WAEC certificate to be President, but you need NYSC certificate as a graduate to occupy any elective or appointed position...SMH!!!! For those who care to understand, the quote attributed to Keyamo is only one thing he said among MANY other things he explained in the course of an interview on channels TV yesterday. If you watched the show, you might have drawn a different conclusion from that implied by this short quote. I blame the media for the chronic dumbing down of many Nigerians. He didn't say YOU don't need waec to be President. He rather implied that according to the constitution, having risen to the rank of Major General, BUHARI does not need waec certificate to be President of Nigeria. You should make your own findings and THEN draw your own conclusions, not just react based on headlines. Its like all the learned people associated with Buhari are loosing their senses. 1st minister of Edu says medical graduate should consider farming. 2nd, Fashola says Accidents are not caused by bad roads, now Festus the Ewu says this. No wonder Mc Oluomo can compare his uneducated clan with graduates. This country is a scam!!! And Keyamo is a 'san'oooh, yet see how low he has descended just for political appointment. All you abusing @fkeyamo are illiterates and the foolish because of sentiments Was the constitution written by Keyamo? Enlighten yourself and read up exactly what your constitution says before you open your bucal cavity to abuse innocent man.